GEMSTONE is a stout made TOPEKA son who combines a birth ratio of 92 with a weaning ratio of 103. 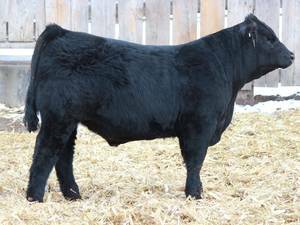 His dam is a high-volume, easy-fleshing female who has an average weaning ratio of 106 on 4 calves and ranks as an ASA Silver Dam on the 2011 listing. His grandmother is a consistently light birth weight female. She is a near-perfect uddered, moderate and easy-fleshing cow who was enrolled as a donor dam in our ET program in 2011.